This is a specific Hanuman Yantra – Mantra Sadhana performed to keep oneself and ones home safe and secure from evil spirits, ghostly entities, evil – eye, black magic, sudden illnesses, household and domestic problems and also enemy problems. The Sadhana is done on any Amavasya [no moon day] night at 11PM. The Yantra can be prepared on Bhojpatra or white paper and written with any kind of ink. Then it should be kept in the Pooja Place and offered blue colored flowers, agarbatti and gulal. I have specifically mentioned gulal; gandhak or any other powder should not be offered in its place. An Oil Lamp has to be lit and then the mantra given below has to be chanted 27 times; placing your right hand over the Yantra. Then you can worship this Hanuman Yantra in the same manner everyday. 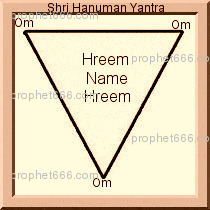 The Hanuman Yantra can also be prepared in Hindi – replace Om with ॐ and Hreem with ह्रीं . what should be wriiten in palce of name ?????????????? What should be return in place of 'Name'? do we need to offer blue flowers and gulal every day during prayer or is it just the oil lamp and 27x mantras every day during prayer. No the Sadhana is done only once. The mantra should be chanted once everyday with your usual prayers. Sir. Can you please clarify the boundry of the yantra. e.g. two black lines are visible on right and below the yantra ( outer side) and two black lines on top and left (inner side) . The image of the Yantra is given only as a guideline, it has to be prepared as explained in detail in the post. 1- can you please clearify which night of amavasya the puja has to be done. For example - next amavasya is on 4th july 2016. the amavasya tithi according to panchang starts on july 3rd (sunday) at 18.53 p.m and ends on july 4th ( monday ) at 16.30 p.m . so guruji in this case the pooja has to be done on sunday night 11.00 p.m( july 3rd ) or on monday night 11.00 p.m (july 4th) . ..please reply guruji as i want to try this in coming amavasya.. Yes on the specific time falling during the period of the Amavasya Tithi on Sunday. The Hreem Mantra should be written in Hindi, but the name can be written in the English language. Can you please reply I will really appreciate it. Yes, that is right, it is the same Gulal,which is used in processions and Holi. THANK YOU SO SO MUCH SIR I REALLY APPRECIATE FOR RESPONDING BACK.